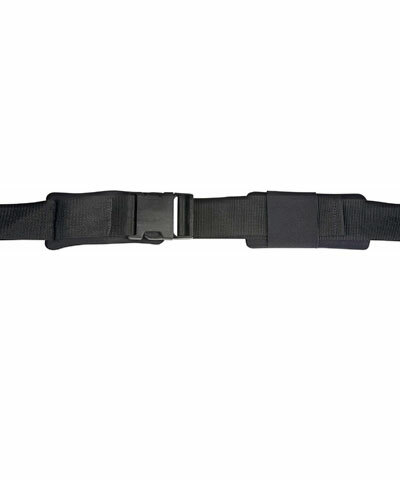 This accessory is a two piece positioning belt, 1" webbing, two padded modules (foam covered with Neoprene mounted on each belt providing for protection of both ASIS´s ) and a Fastex Buckle closure. Tri-Glides are woven on the belts for tension adjustability. At the ends of the belts are easy to install belt anchors. This will benefit the client who needs a 45 degree pelvic positioning belt that, due to significant tension or poor skin integrity, needs the pressure protection of the padded modules. The BioForm Positioning Belts are also offered with "split pads" secured to both sides of the positioning belt. This option is effective for accurate protection of the A.S.I.S. bones as the pads can not slide off of the bony prominences.